Finless porpoises, a rare type of toothed whale, may be even more endangered than previously thought. A survey of finless porpoises in Asia has revealed there are two species, not one, and that they rarely intermingle. More worrying, finless porpoises living in the freshwater of China's Yangtze river are genetically unique, say scientists, who warn that greater efforts must be made to prevent these animals, numbering fewer than 1000, from following another Yangtze cetacean, the Baiji, to extinction. Finless porpoises (Neophocaena phocaenoides) inhabit a wide range of tropical and temperate waters around the Indo-Pacific region. For a long time, zoologists have noted how these porpoises appear to differ depending on where they live. Those living around China, for example, have a few different morphological characteristics depending whether they live in the Yellow Sea, South China Sea or up the Yangtze river, which holds fresh rather than seawater. But a new study published in the journal Marine Biology has revealed just how distinct each population of finless porpoise is, with significant implications for their conservation and survival. 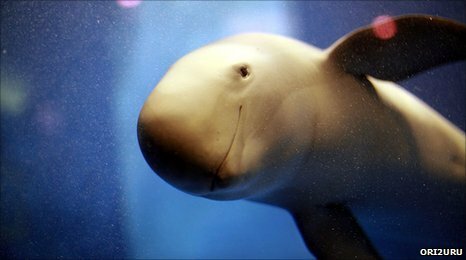 "The most surprising finding of this study is that the Yangtze finless porpoise represents a distinct genetic grouping, which is distinct from marine porpoises," says Professor Guang Yang of Nanjing Normal University in China, who conducted the study with Professor Michael Bruford of Cardiff University, UK and colleagues at Nanjing. Conservationists currently consider all finless porpoises to be the same species. But Prof Yang and Prof Bruford's team analysed the genes of 125 finless dolphins living around China, including in the Yellow and South China Sea and Yangtze river. And the results suggest that special regard should be given to the freshwater porpoises, which should be managed and conserved separately, they say. "The freshwater nature of this population makes it unique," says Prof Yang. The "jury is still out" on whether the Yangtze finless porpoise should be granted species status, as more data is required, say the scientists. But it is so genetically unique, and rare, that special efforts should be made immediately to protect it. "The most recent field survey conducted in 2006 suggested that there were around 1,000 individuals in the Yangtze River," says Prof Yang. "This is much smaller than previous estimates, suggesting a significant population decline in the past two decades." China is already considering upgrading the conservation status of the Yangtze population of finless porpoises, from a national II conservation grade to national I. 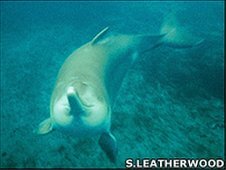 However, "at least in China, most conservation biologists and cetologists have a strong feeling that the Yangtze finless porpoise has a very high risk of extinction, and is very likely to follow the Baiji to extinction within a short-term period unless conservation measures are put in place," says Prof Yang. The Yangtze River holds the dubious distinction of being the site of the first recorded extinction of a cetacean (whale, dolphins and porpoises) since records began. In 2007, conservationists declared extinct the Baiji (Lipotes vexillifer), a species of river dolphin endemic to the Yangtze River, after repeated surveys over many years failed to sight a single animal. Development, industry, pollution, overfishing and the commercial use of the river by boats have all been blamed for contributing to the Baiji's demise. The scientists' survey also revealed that finless porpoises living in the sea should be considered two separate species. Those porpoises living in the Yellow Sea are distinct from those in the South China Sea. The genetic data showed there is no or very little gene flow between these two species, even in areas where they overlap. Therefore each marine population should be conserved separately, warn the scientists.